At morning assembly last Friday Sean Kretz head teacher of Yewstock School, Sturminster Newton announced the go ahead for the school’s new Rebound Therapy Project. 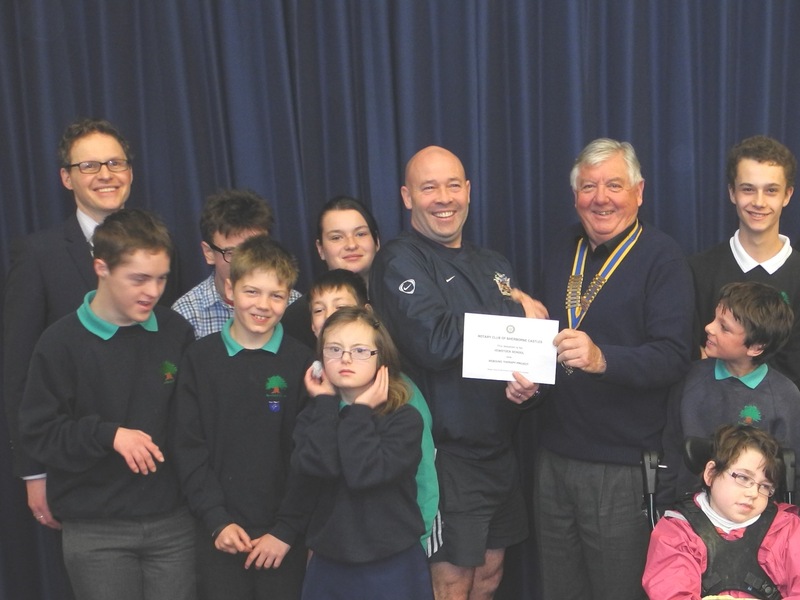 He told the assembly that he was able to do so thanks to the Rotary Club of Sherborne Castles who had brought along a donation of £500 towards the cost of the trampoline they needed. He introduced President John to the school and invited the children to guess why he was wearing the colourful medal around his neck. One guess was that he was an Olympic Champion and another that he was a Mayor. He then explained that John was wearing it because he was the President of the Rotary club who were making the donation to the school. The donation together with other funds that had been identified meant that the project could go ahead and would be completed and ready to use during the summer term. Rebound Therapy is used to describe the use of trampolines in providing therapeutic exercise and recreation for people with a wide range of special needs. Participants range from mild to severe physical disabilities and from mild to profound and multiple learning disabilities, including dual sensory impairment and autistic spectrum. Previous Entry Rotary Charity Fundraisers -everybody wins!